In mechanical insulation audits, there are many areas of opportunity for potential savings and payback for customers. My interest in the energy appraisal business started by realizing the amount of energy and emissions that are lost "up the stack" at many different facilities. I invested in equipment and time developing a comprehensive report, and utilizing the 3E Plus program with information to provide accurate documentation to the customer. The documentation provides data in which the reduction of fuel required to achieve the same amount of energy brings the following correlation; less fuel equals less emissions and less disposable solid waste. 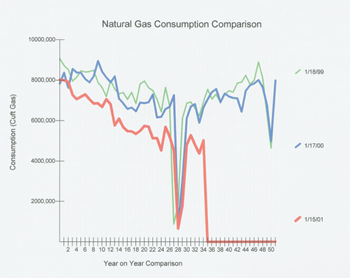 The reduction of green house gas emissions, i.e. sulfur dioxide, nitrogen oxides and carbon dioxide is a direct result of less fuel used to generate power. Landfill usage is also lessened, because solids such as fly ash (which comes from unburned fuel sources after combustion is made in the boiler) is greatly reduced. Over many years of site visits in the industrial market it’s quite unsettling to find so many incorrect applications and poorly installed insulation systems. It’s also very frustrating, as an insulation contractor, to come in second only because the "successful" bidder didn’t follow industry standards in the evaluation of the project, therefore creating an uneven playing field. The customer also suffers a loss by accepting an insulation application that may not fit the original intent of the design criteria. The type of facility will determine the next steps in conducting the appraisal. In power generation facilities it’s important to determine the fuel source used. Coal, natural gas and wood, to name several, will determine the types of emissions that will be evaluated. Emissions such as sulfur dioxide and carbon dioxide are commonly evaluated, based on the type of fuel used to produce electricity or steam. I have found in certain regions that the facility pays for permits, allowing a certain volume of monitored emissions. The fee is adjusted accordingly for anything in excess of that permitted amount. This fee then becomes a part of the monies involved in the savings realized in an audit report. The type of fuel has certain BTU ratings and emission factors that are entered into formulating specified cost savings and emission reductions based on the difference between insulated verses uninsulated surfaces as determined in the report. The fuel cost per BTU, generally obtained from the customer, must be entered into the audit to establish the money saved, or positive cash flow, after the insulation improvements are completed. The fuel cost must include conversion efficiency (from fuel to heat) and operational expenses. There are additional components of determining fuel costs that may be added into the report regarding tax and interest rates, capital investment rate, and fuel inflation rate. Cooling plants require additional information regarding depreciation rates and coefficient of performance, cooling make-up water cost per gallon and water inflation rates. Additional information that further strengthens the case for an energy audit is that a typical power plant operates at 30 percent to 35 percent fuel efficiency. A typical boiler operates at 50 percent efficiency. Most energy contained in gas or oil used to fuel a power plant doesn’t end up at the generator bus bar (electrical box). The life of the equipment required to produce so much energy is also improved. This lowers maintenance costs and frequency of equipment replacement, along with pollution control modifications. Another consideration is the comfort level and safety for employees within the facility. If you are sweating profusely during the preliminary walk-down, this may be a good indicator that heat is being released beyond the insulation systems in place. If an employee is working in this type of uncomfortable environment, their production level is more than likely hampered by the excess heat. This could be considered another variable in providing a better return on an insulation improvement investment. The appraisal process begins with marketing: Identifying the type of business that would require large amounts of energy to produce or refine a particular product, such as electricity, petroleum, plastics, steel, aluminum, food products, packaging and paper. The next step is to identify what level of personnel to approach. This requires personnel that are cognizant of the daily operations of the facility, such as a plant engineer or plant manager. 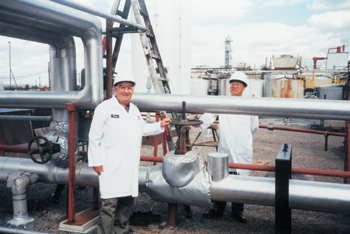 It becomes more apparent that the upper level management such as the chief executive officer or controller of the facility has the resources available regarding capital financing decisions and realizes that for every dollar saved on energy, pollution control requirements and safety could be applied to the bottom line. The appraisal consists of these basic steps. 1. A preliminary site evaluation of the mechanical insulation systems is conducted. This evaluation determines if a detailed audit is even applicable for the facility. A site walk-down, with a plant representative that’s knowledgeable of the plant layout, is needed to understand the basic systems involved. 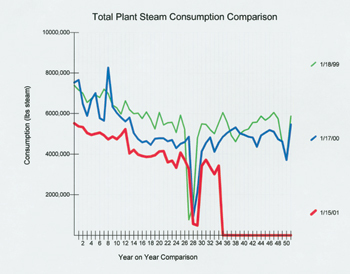 Typically, non-insulated steam and condensate systems provide the highest rate of return. This walk-down is best performed when the systems are in operation, as the infrared gun used can easily detect the heat losses in the system, thus identifying potential insulation failures. A visual inspection is conducted to note either under-insulated or uninsulated piping, valves and/or fittings. Hot gas ductwork and/or related equipment utilized in the heat recovery process also provides opportunity for additional savings areas. Boilers, sidewalls, headers, hoppers, economizers, turbines and other components of power or process production are evaluated for potential insulation improvements. In some cases it may become apparent that the level of maintenance and insulation design was sufficient and a reasonable return on any insulation improvements, weren’t evident. A prudent decision must be made at this point to inform the customer if a fully detailed audit is required at their facility or determining that an audit wouldn’t benefit the customer with a reasonable payback period. 2. The next step is to identify the scope of the audit. This process starts as part of the initial walk-down, as described earlier, from areas that were noted and discussed with the facility representative as an opportunity for savings. Generally, these potential areas of improvement may be noted. Once these items are referenced and charted, measurements must be documented. The size of the pipe, equipment, and/or ductwork areas are critical in calculating the potential energy losses and emissions. Readings of temperatures are obtained through the use of temperature guns, infrared cameras and contact thermometers, or utilizing engineering data that accurately details the operating (not design) temperatures of the system. I utilize an infrared camera for documentation purposes. In understanding a thermograph image, practice is required to comprehend how to interpret certain conditions and the readings on the imaging process. It’s very important in understanding the emissivity factors on the insulation finishes or bare metal on piping or equipment surfaces. The readings may be greatly affected because of the reflective properties of the surface being analyzed. The emissivity settings also apply to the use of an infrared heat detection gun. Incorrect settings may give false temperature readings of as much as several 100 degrees fahrenheit. Areas indicating a specific heat loss should be noted and identified, if possible, with a photo image and an infrared image. This type of documentation lends additional credibility to the final report. 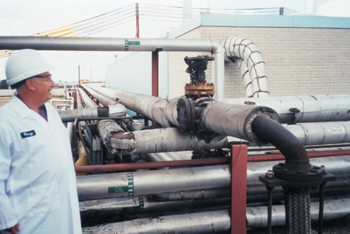 Every lineal foot of a steam or condensate line doesn’t have to be photographed for reporting purposes. However, the size and footage must be noted. Items of photo documentation may include pressure reducing stations, equipment access doors, valves, bonnets, vessel components, or specific areas of concern. 3. The site conditions must be documented for insulation calculation purposes as well as extensions of the energy saved results. What are the "degree days" for that region, average wind speed, ambient temperatures inside and out during the data collection time? What is the type of fuel used at the facility. The location of the specific work area must be defined (Elevation above grade or floor, confined space, accessibility). Are the systems being audited indoor or outdoor? Is the process operational all year or is it seasonal? This information is considered necessary for determining productivities and developing a more accurate insulation price, if the work is to be performed by a qualified contractor. 4. Quantification of the under-insulated or noninsulated pipe or equipment is required for completion of the report. The results of the data collected for the temperature differential must be used in determining the BTU’s saved from a bare surface to an insulated surface. These calculations are used in establishing an insulation estimate and providing insulation types and thickness for the noted temperatures and conditions. 5. The next phase is creating an audit report format. This is an important and time-consuming element of the audit report process. It requires a layout that allows the customer to easily identify and locate the components of the actual site survey. This level of detail gives credibility to the audit report, showing the customer familiar check points that can be located by the careful selection of grid marks or identification numbers. The use of orthographic drawings, process and instrumentation diagrams, and specifications prove to be very helpful as reference points of the report, as well as reducing on-site related take-off work. 6. The insulation selection: The type of insulation and finish for a particular application for steam, hot water and chilled water, to name several, must be established to provide the customer with a possible solution for determining corrective actions reflected in the report. Those familiar with insulation industry standards understand that selection of insulation types, application methods, labor market and other variables can greatly effect pricing provided in an audit or estimate. This is where experience as an insulation estimator is very beneficial to obtaining accurate cost information intended for the audit. 7. Data must be entered into different formulas or programs to provide heat loss and emission loss results. As mentioned earlier, the 3E Plus program that was designed and distributed for use by the Department of Energy and the North American Insulation Manufacturers Association (NAIMA), has proven to be an excellent tool in obtaining results for the audit. The individuals who meticulously developed this program should be recognized for this exceptional work. This information must be linked to deliver the end result in an understandable format. The cost to insulate the system must be determined, thus showing a comparison of energy saved (converted to dollars) versus estimated insulation costs. After this information is documented, the "payback period" may then be calculated. Payback period is figured by dividing the cost of the insulation upgrade by the amount of energy saved. In addition, the report should contain information that indicates type of equipment used in the survey i.e. ; temperature measuring tools, types of cameras (digital and infrared used for documentation. Qualify the report indicating labor market considerations, insulation application types and calculations used to determine the BTU loss/ gain showing equations applicable to the audit. Figure 1 (tank farm; see link) is a portion of documentation contained in my audit of the Unilever Edible Oil Plant in Toronto Canada, and the results of a food oil process plant. It’s really a very simple concept in understanding the benefits of having a mechanical insulation audit performed at a facility. Inadequate insulation or noninsulated systems costs energy and dollars. The information contained in the audit may also aid the customer in preparing a scope of work for future insulation bidding purposes and provides budget information.